IndiGo has turned down the Delhi airport's proposal to split its domestic flights between the choked Terminal 1D and Terminal 2, which will soon be made operational. The low-cost carrier has made it clear that it wants all its domestic flights under one roof. "We will support all efforts that make things better without splitting our domestic operations out of Delhi and thereby creating inconvenience to our customers," said IndiGo spokesman Ajay Jasra. Low-cost carriers IndiGo, SpiceJet and GoAir operate their domestic flights from T1 in Delhi, while Air India, Jet Airways, Vistara and AirAsia India use T3 for all their flights. With T1D becoming a nightmare for flyers, especially during peak hours, DIAL CEO I P Rao had given some options to the three low-cost carriers. These included relocating some flights from T1 to T2; from February 1, having all new flights at T2 or a higher frequency at the terminal; and from February 15, shifting their flights to Mumbai, Bengaluru and Kolkata from T1 to T2. While SpiceJet and GoAir did not officially take a stand, a senior official from one of these airlines said: "It is a ludicrous suggestion. If our plane flies in from Lucknow and comes to T1 and then it has to fly to Mumbai, it will have to cross an active runway to reach T2. This entire process will increase time and cost. We are waiting for a sensible suggestion to decongest T1." Another official said, "The only acceptable option is to shift some airlines fully from T1 to T2. DIAL should speak to the airlines and act before the summer travel season starts mid-April". DIAL has refused to talk about its course of action. Apart from giving relief to the flyers, decongestion of T1 is also needed so that DIAL can start work to expand its capacity from 2 crore passengers per annum to 3.5 crore per annum. Indigo has added a new A320NEO to the fleet today, as VT-ITO. In their recent earnings call, indiGo announced the following destinations will be launched within a 90 day period. indiGo will also take delivery of 5 more A320neos and 1 A320ceo before the end of FY2016-17. Indigo has added a new A320NEO to the fleet today, as VT-ITS. 6E reduces Bengaluru-Thiruvananthapuram to 3 daily effective 01MAR. 6E103/408 has been cancelled (redeye flight). They will have to - thanks to the bog down in deliveries from Airbus. Have they also cut down on DEL-TRV? Engine trouble on the Airbus A-320 new engine option (Neo) shows no signs of abating. On Saturday, an IndiGo A-320 Neo developed a snag in one of the engines, manufactured by aircraft engine makers Pratt and Whitney. "The aircraft (VT-ITC) got a 'oil chip detected' warning for one engine at Vadodara. It had to be flown back as a ferry (without passengers) to Delhi on Sunday for engine change," said a source. IndiGo did not comment on this latest trouble with this engine. Till the time of filing this story, it could not be ascertained at what stage of flight the latest engine trouble with A-320 Neo happened. Saturday's trouble is the fourth in less than a month with both IndiGo and GoAir - that use A-320 Neos with P&W engines - reporting two engine issues each. IndiGo A-320 neo on Saturday reportedly got an "oil chip" warning similar to the one that was witnessed by a GoAir A-320 Neo which had taken off from Delhi for Bangalore on February 8 and had to return to Delhi after a fire scare on an engine. P&W spokesperson Sara Banda told TOI: "Pratt & Whitney is supporting GoAir and IndiGo to assess the situation and minimize any disruption. At this time, it is premature to speculate on the cause of the issues while they are still under review. We are working closely with our customers and our suppliers in order to address and resolve these issues quickly. The PW GTF (geared turbofan engine) engines are a game-changing, break-through technology with more than 82,000 hours in service." Directorate General of Civil Aviation (DGCA) chief B S Bhullar had recently said that the regulator is studying the engine trouble on the Neo. The A-320 is the most commonly used plane in India with airlines like IndiGo, Air India, GoAir and Vistara using this equipment. From the same date, another redeye flight gets the axe - Chennai-Kochi reduces to 3 daily. From 16MAR, Delhi-Udaipur will reduce to 2 daily (the freed up aircraft will do Delhi-Amritsar instead), while Mumbai-Kolkata/Thiruvananthapuram will reduce to 6 daily and 1 daily respectively (freed up aircraft will do Mumbai-Amritsar instead). Indigo has added a new A320NEO to the fleet today, as VT-ITP. Temporary cut due to the runway closure. IndiGo has roped in former United Airlines executive Cindy Szadokierski as a consultant for its airport operations. Ms Szadokierski would be the third executive from United Airlines to be on board with IndiGo after Greg Taylor and Rohit Philip in the recent past. One of the promoters of InterGlobe Aviation -- the parent of IndiGo -- Rakesh Gangwal has also served at United Airlines. Sources said Ms Szadokierski has been roped in by IndiGo as a consultant for airport operations. When contacted, an IndiGo spokesperson declined to comment, while queries sent to the airline's President Aditya Ghosh remained unanswered. Ms Szadokierski is being brought in at a time when the carrier is grappling with multiple issues, including those related to on-time performance and engine troubles in its A320 neo planes. With Ms Szadokierski, there would be at least three former United Airlines executives at senior levels of IndiGo. Taylor joined the no-frills airline as Executive Vice President for Revenue Management earlier this month, while Philip has been serving as Chief Financial Officer since May last year. IndiGo on Thursday became the twelfth airline to introduce a self-service check-in facility for its passengers at Mumbai airport. IndiGo passengers who have not done a web check-in, but who want to skip the check-in queue at the airport can print their boarding passes using CUSS (common-use self-service) kiosks. "Currently, only IndiGo passengers who don't have bags to check-in can use the kiosk. They can print their boarding pass and proceed directly for a security check. Later, IndiGo passengers with check-in bags too will be able to use the facility by printing baggage tags and dropping check-in bags at the dedicated area, like other airline passengers," said a Mumbai airport official. The kiosks have been gaining popularity, the official said, adding that 23% domestic passengers use them. The airport handles an average of 41,000 domestic passengers a day, out of which over 9,000 use self-service kiosks to print their boarding pass and check-in baggage tags," said the airport official. Air India was the first to introduce self check-in kiosks at Mumbai airport. After AI introduced the kiosks last April, other airlines followed suit and the facility is provided by Jet Airways, Lufthansa, SriLankan Airways, Cathay Pacific, Egypt Air, British Airways, Kenyan Airline and Air France, which operate from the integrated terminal 2 in Sahar. Spice Jet and Go Air have the facility in the domestic terminal. In the past two months, domestic flights have been flying to almost full capacity and a direct fallout of it is longer check-in queues at the airport. At the space-starved Mumbai airport, the longer queues have made a case for the automated self check-in kiosks, which reduce congestion. New additions by Indigo come March 26. InterGlobe Aviation Ltd, which operates India’s biggest budget airline IndiGo, said it is looking to convert some of its Airbus A320neo planes to A321neos that will allow it to fly more passengers per flight and increase flight range. IndiGo which has about 400 A320neo planes on order is adding about two planes a month to its fleet of 129. The planes were leading to fuel savings of 15%, IndiGo president Aditya Ghosh said on the sidelines of the opening of Airbus training facility in the capital on Friday. Ghosh also said the airline may look at all engine options for the next set of engine orders for its A320neo planes. The airline currently has Pratt & Whitney engines which have been mired in technical issues. The airline’s chief financial officer, Rohit Philip, said there was no financial impact yet from the grounding of Airbus A320 NEO planes following issues that arose with the Pratt and Whitney engines fitted on them but declined to comment on whether the airline would seek compensation for the engine issues, according to Reuters. 6E294 IXA1550 - 1725CCU 320 D.
All flights except Delhi-Ahmedabad are temporary additions that last until 30APR. Indigo has added a new A320NEO to the fleet today, as VT-ITR. They plan to eventually 6 daily operations out of Doha - once daily each to Chennai, Delhi, Kochi, Kozhikode, Mumbai and Thiruvananthapuram. The following are their tentative slot schedules. Indigo has added a new A320NEO to the fleet today, as VT-ITQ. IndiGo sets 30,000 feet altitude limit for Airbus A320neos to reduce engine strain. IndiGo and GoAir, among to first to fly the new Airbus A320neo, have been forced to find ways to deal with vexing technical snags with the Pratt & Whitney engines that power the aircraft. IndiGo has asked its pilots to fly snag-hit A320neo planes at a lower altitude, 30,000 feet, and not the usual 36,000 feet, to reduce strain on engines even though it will mean higher fuel burn. GoAir CEO Wolfgang Prock-Schauer said in an interview in February that Pratt & Whitney “will support us properly with spare engines and other support needs to be there so we can overcome the initial phase and don’t have any flight disruptions”. A Pratt & Whitney spokesman said it has no comment on the subject. On 21 March, Ashim Mittra, vice-president (flight operations), IndiGo, said in a note to pilots that Pratt & Whitney had proposed limiting the altitude of flying to 30,000 feet for A320neo planes to avoid a possible glitch in the engine lubrication system and that, effective 22 March, IndiGo had decided to adopt the recommendation. Mint has seen a copy of the note. Since flying at lower altitudes consumes more fuel, the note asked pilots to fuel up accordingly. IndiGo Airlines has signed lease agreements with AWAS for three A320-200s. The lessor said in a statement the aircraft are due for delivery later this quarter. An Indian LCC, IndiGo currently operates 112 A320-200s as well as nineteen A320neo on flights to thirty-nine domestic destinations as well as six in Thailand, the United Arab Emirates (UAE), Nepal, Oman, and Singapore. IndiGo, India’s largest carrier by domestic market share, announced flights to Qatari capital Doha. The flights announced earlier this week will be effective 5th May, initially from Delhi & Mumbai. The airline had announced 6 new destinations – 3 each on domestic and international side during its analyst call post Q3 results. Madurai & Amritsar are operational while Mangalore will see services from 1st May. The airline launched its 6th International destination – Sharjah, on 20th March 2017. The only destination unavailable for booking is Dhaka. Doha’s Hamad International Airport is the hub of National carrier of Qatar – Qatar Airways. Qatar Airways has repeatedly expressed interest to invest in IndiGo, the largest and most profitable Indian airline. There has not been a positive response from IndiGo. Recently, Qatar airways announced its intention to start a 100% Foreign Owned Airline in India. IndiGo flights to Doha could affect Jet Airways the most, as it is grappling with slump in the Gulf market. With a lower CASK (Cost Per Available Seat Kilometer), IndiGo could well make Doha work with cheaper fares than Jet Airways. Doha is connected with Delhi, Kochi, Calicut, Mumbai and Trivandrum by Jet Airways. IndiGo has announced flights from Delhi and Mumbai. The airline is believed to launch flights from Kochi, Trivandrum, Calicut and Chennai, thus competing with Jet Airways on all routes. Lovely analysis Sir, I enjoyed the read early in the morning. With the NEO impediment, it will be interesting to see how Indigo goes about it. They have one of the best think-tanks around...the next few months will be rather interesting. And I trust that you will give us the analysis of Indigo's moves, as and when they come in! Indian low-cost carrier IndiGo during the month of April and May 2017 further expands domestic service, including the launch of several new sectors. Indigo has added a pre-owned A320 to the fleet today, as VT-IHD. An IndiGo Airbus A320 aircraft operating as 6E 756 between Bhubaneshwar and Chennai created a record on Friday. This was the airline's 900th daily flight, the most by any Indian airline. IndiGo is the country's largest domestic airline with 40 per cent of the market share. IndiGo's flights are nearly equal to the combined operations of Jet Airways and SpiceJet. Jet Airways operates 650 flights daily and SpiceJet flies 343 flights daily. 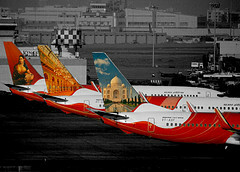 Air India and its subsidiaries, Alliance Air and Air India Express, operate over 520 daily flights. Having added 24 planes in the financial year 2016-2017, the highest capacity addition among all the airlines, IndiGo has 131 Airbus A320 aircraft now. It flies to 44 destinations, with over 90 per cent of its flights flying to domestic destinations. Its longest route is Delhi-Thiruvananthapuramuram and the shortest route is between Amritsar and Jammu. IndiGo has added over 100 flights in the past ten months. Last June, IndiGo was operating 806 flights with 108 aircraft. In a statement, Aditya Ghosh, president and whole-time director, IndiGo, said, “We at IndiGo are thrilled on having flown 900 daily flights for the first time on Friday. I understand it's some kind of a record for civil aviation in India. Now the team is excited to reach the 1,000-flight milestone." An Indigo Airbus A320-200, registration VT-ITK performing flight 6E-252 from Raipur to Kolkata (India), was in the initial climb out of Raipur's runway 06 when a bird impacted the nose of the aircraft. The crew stopped the climb at FL070 and returned to Raipur for a safe landing on runway 24 about 35 minutes after departure. A replacement A320-200 registration VT-IFG reached Kolkata with a delay of 5.5 hours. Indigo has added a new A320NEO to the fleet today, as VT-ITV. IndiGo on Friday said it will operate 18 new additional flights, starting June, as part of its summer schedule. The Gurgaon-based airline, which currently operates over 900 flights, will add these flights to the existing routes, including Bengaluru-Delhi and Bengaluru-Hyderabad, a release said today. IndiGo will operate its 15th flight between Bengaluru and Delhi (to and fro), and 10th additional flight between Bengaluru and Hyderabad and Kolkata and Bengaluru (to and fro), the airline said. Besides, the carrier will also operate new additional flights from Ranchi, Guwahati and Thiruvananthapuram, it said. "It gives me immense pleasure to announce these new frequencies, which will provide even more flexibility of choice to our customers, and connect these destinations across India," IndiGo Whole Time Director and President Aditya Ghish said in the release. The new flights will provide increased frequencies on the routes and offer greater travel options to the customers, IndiGo added.